When you have loaded or created a CP-net, and it is successfully syntax checked (i.e. there are no orange or red auras; see Syntax checking), you can start running simulations. A simulation report will be saved if the appropriate options have been checked. To start a simulation, drag the simulation tools from the index to the workspace. Now select and apply one of the simulation tools from the tool palette. See simulation tools for more details on the available simulation tools. Applying, e.g., the Play tool from the simulation palette will cause the simulation to run a number of steps as specified in the tool cell. 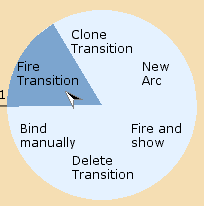 It is also possible to execute single simulation steps using if you manually choose bindings or apply one of the simulation tools from the transition marking menu to an enabled transition. 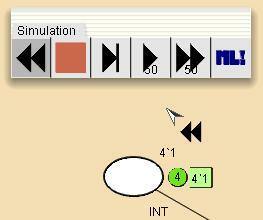 Use the Rewind tool from the simulation tools to return a CPN to its initial state (initial marking). If you have changed or added initial markings on some of the places, you may have to use the Rewind tool to revert the net to the initial state.